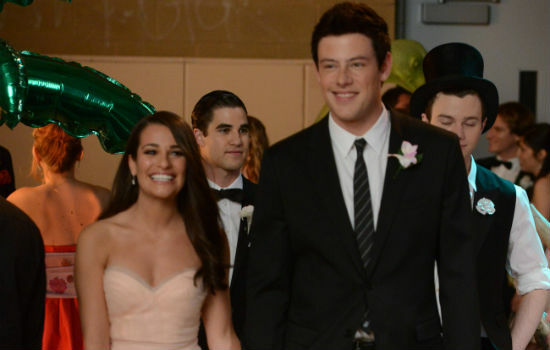 Even at its lowest point, Glee still manages to be at least somewhat entertaining, but that was before "Prom-asaurus" which has to be the worst episode ever. Yes, it was worse than "Hairography" and "The Spanish Teacher" combined. I actually hated this episode and I never hate this show, so that should be an indicator of the awfulness of this abomination. Since senior year's coming to end, we had to sit through yet another prom (with the worst theme ever), and once again Quinn and Santana were the two top contenders along with some random person we've never heard of before. Apparently, Becky was also vying for the crown but wasn't able to get enough sympathy votes unlike Quinn. Her solution: throw a temper tantrum. Unfortunately, Becky wasn't the only one having a pity party because Rachel was too since she blew her NYADA audition and had to watch Finn campaign for prom king and queen with her former-rival-turned-best-friend. Instead of going to prom, she decided to throw an ant-prom party with Kurt and Blaine (who couldn't attend the real prom because of a stupid ban on hair gel). Of course, everyone came to their senses and ended up at the dance where Rachel was crowned prom queen thanks to some Quinn and Santana shadiness because they somehow ended up counting the votes. Now to be fair, "Prom-asaurus" was not inherently bad like some previous episodes of Glee, but I was able to find something to enjoy about them. I could not say the same thing about this one. The plot was so boring, and it was proof that Season 4 should move on from McKinley because I'm over watching these characters reach high school milestones. At least I was over it while powering through the hour, and I'm sure my feelings will change once I calm down a little. What made things even worse was the fact that it was almost completely devoid of any humor or any real emotion. I'm supposed to feel for Rachel after she acted like a little brat ... again? Quinn using her accident for pity votes just to have a last second change of heart was supposed to be okay and a sign of growth? Really? I have my limits when it comes to how much juvenile nonsense I can tolerate, and "Prom-asaurus" blew right by them. Gah! While I detested most of this episode, there were a few bright spots. I've really enjoyed what the writers have done with Puck over the last couple of episodes, so much so that I wish we could go back and change his entire storyarc that took place at the start of the season. I'm much more interested in this more vulnerable and nice version of the character than the cad who wasted time trying to bang his teacher while putting up with the psycho he knocked up. There were also some grim worthy moments thanks to Blaine and Mike Chang, but they weren't enough to make up for the rest of the mess. On the Music Front: All of the songs sucked, so let's move on. I love Heather Morris, but Brittany has got to go! Her bit's worn thin, and she was responsible for the majority of the awfulness that transpired during this episode. There was way too much Becky during this episode, and I was disappointed with where they took the character. Yet, she's still had more lines and screen time than Tina this season. Another highlight: Santana laying into Rachel with some hard truth. Rachel and Quinn made me so freaking angry, but of course everyone's going to hate on Finn for some inane reason. Is the song that Brittany sang at prom even real? Finn shouldn't have left his bro behind. Didn't he spend all of the last episode making sure that didn't happen? This is where I tend to list memorable quotes, but none come to mind. Maybe I'll add some later. Usually, I don't mind it when Glee tries something that's not good just as long as I'm entertained and I don't feel like I wasted my time. "Prom-asarus" was the first episode that I regretted watching because it made me want that hour back. But I've forgiven this show in the past, and I know that I will again because I'm just that much of a sucker. << Next Episodes: "Props" and "Nationals"